Home UFO Mysteries What was the Phoenix lights UFO sighting? What was the Phoenix lights UFO sighting? The Phoenix Lights – The Greatest Mass UFO Sighting Of All Time? Known as The Phoenix Lights, the events of March 13th 1997 consisted of two mass UFO sightings that were witnessed by thousands of people from Phoenix to Tucson. For weeks the event was limited to local folklore, but when USA today ran a front page story on the event, the Phoenix Lights shot to prominence and the events have been a mainstay of UFO documentaries ever since. But what could have prompted so many reports across such a huge area? 19:55 (MST) – A group of lights in a V-Shaped formation were witnessed in Henderson, Nevada. Witnesses state the lights were roughly the size of a large passenger jet. 20:15 – Multiple reports of a similar formation come in from Prescott, Arizona, some 200 miles South-East of Henderson. Shortly after, more reports of lights in the sky came in from nearby Dewey, AZ, 10 miles East of Prescott. 20:20 – Reports of the V-shaped formation spread to areas around Phoenix including Tempe and Glendale. 20:30 – A man and his wife witness a light formation above their home in Chandler, 20 miles South-East of Phoenix. 20:45 – A report of lights in the sky is received from a man in Tucson, 100 miles South-East of Phoenix. According to the report the lights were visible for around 10 minutes before disappearing behind the Santa Catalina Mountains. 22:00 – A new, even larger wave of reports come flooding in from Phoenix. Witnesses describe a number of lights hanging in the air above the city for a substantial amount of time. While barely any video or photographic evidence emerged from the previous light formation, this second Phoenix event was captured on film by multiple Phoenicians and as such was covered far more widely in the media. While the second group of lights received most of the media coverage (and still do), these were arguably the easiest to explain. Shortly after the mystifying events of March 13th 1997, the US Air Force released a statement claiming responsibility for the second group of lights. Air Force officials stated that the lights were flares released by military jets on exercise at the nearby Barry M. Goldwater Air Force Range. As the jets were returning to their base near Tucson, the pilots realized they had not released their full payload of flares and because Air Force rules prohibit aircraft to land with loaded flares, the pilots were forced to release their remaining cargo not far from the Phoenix metropolitan area. For many, this was explanation enough for what had been a wild and frenzied night in the Phoenix area, but others cried foul. While the 10pm event above Phoenix may be easily explained by the air force statement, what of the fast moving lights that swept across the state from Prescott to Tucson some 2 hours earlier? Indeed, it seems strange that when there remained an element of the unexplained, much of the mass media coverage opted to focus on the more debunked and rational portion of these events. Many Arizonans reported sighting mysterious lights in the sky on the evening of March 13, 1997. 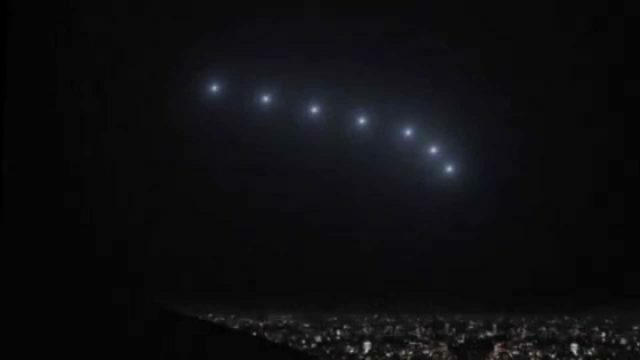 Some described seeing a V-shaped formation, others described observing hovering lights, moving groups of lights, or lights appearing to fade after they passed their position. Initially, Arizona military bases said they had nothing in the air that night. But months later they checked logs of visiting aircraft and confirmed that the Maryland Air National Guard had taken part in a formation exercise that night where aircraft peeled off one or two at a time to drop flares.